Buitreraptor Gonzalezorum At the very same site that the 7 ton Giganotosaurus was found, Buitreraptor was discovered by the Gonzales brothers, Jorges & Fabian. The fact that it is the oldest known Dromaeosaurid provides information about the evolution of Dromaeosaurids, making it seem likely that they evolved in South America & travelled across to other parts of the world. Buitreraptor pushes back the evolution of Dromaeosaurids to the Jurassic, making it an exciting find. It had to be extracted from an 800 pound block of sandstone & took 10 days, the dig team being funded mainly by the Jurassic foundation & NASA, & also with donations by Michael & Jacqueline Ferro. Buitreraptor is the size of a large rooster. Its snout is long, even in Dromaeosaurid terms as is its tail, & its teeth are not serrated, making its exact diet hard to work out. 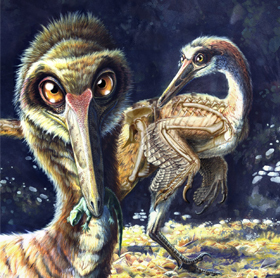 A very-well articulated & good-quality fossil has been uncovered that show it has long legs that make it likely to be very fast. A cousin of Buitreraptor, Rahonavis, has such long & light arms that in some circles it is considered to a flying dromaeosaurid, similar to Microraptor, the famed four-winged raptor that also holds the record for smallest adult dinosaur.